Indian Brook is a relatively small watershed but nevertheless an important cold water fishery located to the west of Town of Blue Mountains. This small watercourse flows down the Niagara Escarpment within the Town of Blue Mountains east of Thornbury, crossing under Highway 26 and entering Nottawasaga Bay at Peasemarsh Nature Reserve. Indian Brook is a spawning ground for Rainbow Trout, Chinook Salmon and Brown Trout. There is a gravel parking lot adjacent to the Highway 26 bridge over the Brook, and paths along the side to a secluded beach. Indian Brook forms a pool fronted by a beach before it enters Nottawasaga Bay. This is an excellent spot for a swim in warmer water (Indian Brook) early in the season, although the Bay becomes warmer than the Brook as the summer progresses. Rainbow Trout and Chinook salmon climb the Brook and you will find Yellow Ladyslipper along its bank. Indian Brook is generally well covered. There are concerns during low flow periods that the aquatic habitat could be impacted, as water becomes very low indeed. Local property owners need to be aware of this and refrain from taking water. They should also be aware that stream erosion protection and vegetation shading are important to the continued health of this stream. 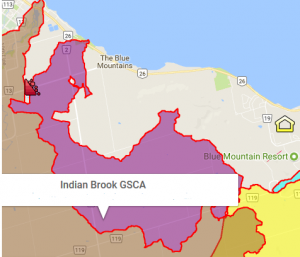 There is a danger of leachate contamination from a Town of Blue Mountains landfill. The landfill (an abandoned gravel pit) is within 60 metres of Indian Brook and within 120 metres of Beaver River. According to a recent report, the landfill did not meet its compliance certificate and at time of writing the Town of Blue Mountains is trying to truck leachate to the sewage plant.